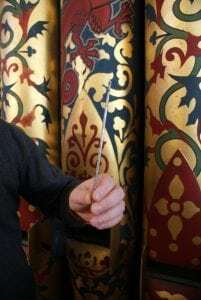 In addition to regular monthly tuning and maintenance visits, occasionally the Chapel organ needs some additional housekeeping work to keep it in good order. 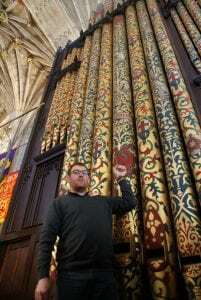 Recently Andrew Scott (Head Voicer) and Jake Holmes (London tuner) from organ builders, Harrison & Harrison of Durham, took advantage of a quiet time in the Chapel and worked inside the organ on the Swell reed stops. The work entailed removing each reed pipe to reset slipped tongues, tighten wedges and replace dropped loads. 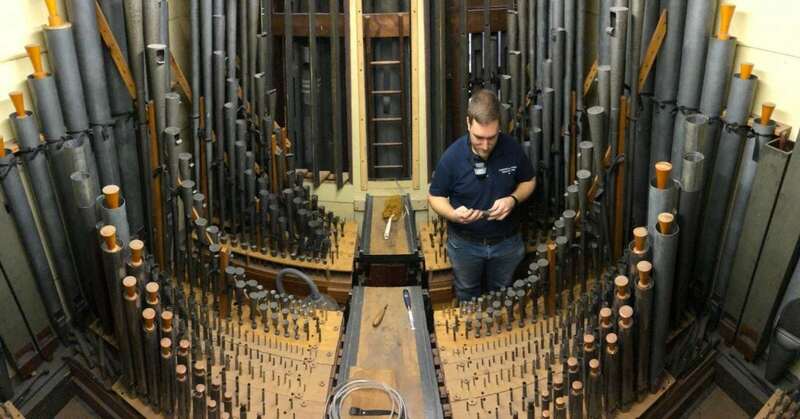 After checking each pipe of the five Swell reed stops (305 pipes) they were tuned and regulated. The video shows Andy explaining some of the work while the images below show him holding the smallest pipe in front of the largest. Next PostNext Last chance to see….